Silicones, particularly polydimethylsiloxane (PDMS), are widely exploited for their surface properties. 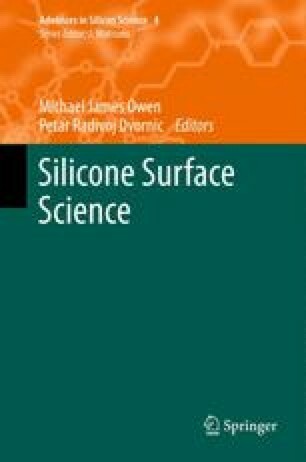 A quantitative review of relevant properties is presented including liquid surface tension measurements, water contact angle studies and solid surface tension determinations from both contact angle and contact mechanics approaches. The properties are considered in the light of the fundamental characteristics of PDMS and related siloxane polymers in order to establish a structure/property relationship of importance in any examination of the surface science of this family of polymers. The central position of PDMS in silicone science and industry follows inevitably from its structure. The combination of small, low-intermolecular-force methyl groups arrayed along the uniquely flexible siloxane backbone produces a polymer whose low surface energy can be equaled or bettered by relatively few other polymers. There is also the additional benefit of greater thermal and oxidative stability than most comparable organic polymers that is important in many applications.